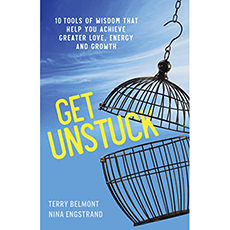 “Get Unstuck” offers tools of wisdom to achieve greater love, energy, and growth. It is intended for those who desire more in life, but do not know where or how to start. It serves as a guide when you lose clear direction in life and need to get unstuck. This book is a collection of stories from people all over the world about how they managed to transition from stagnant situations into a fulfilled life - 10 actionable tools in the right direction. Chapter 2: Frozen in Place. Why? Tool 3: Make a Decision to Take a First Step! Tool 4: Allow Time and Space! Tool 5: What Is Your Excuse? Life is too short not to love! You need to let go! One day I was alone! Step 1: What is making you feel stuck? Step 2: What tools will help you deal with your issue?